After my granddaughter Sierra and I spent June 14 in Kansas celebrating our joint birthday, I returned home to Colorado and began the process of reorganizing my life. Starting on Monday and continuing each day throughout the rest of the week, I cleaned every corner, crevice, closet and cupboard in my small house although I can tell you “small” seemed an inappropriate adjective by the time Friday arrived. This kind of thorough cleaning caused me to question how well I perform my weekly housekeeping tasks; not good it seems as indicated by the dust, cobwebs and other unlikely debris found in the corners and crevices and the amount of clutter found in closets and cupboards. My housekeeping influences came from polar opposites. My mother detested cleaning and her house showed it. My father came from a family that held cleanliness far above godliness, which is saying a lot for his staunch German Catholic ancestors. Growing up, I lived most of the year in my mother’s dust-covered clutter but spent summers with my father’s two matronly aunts, who never allowed a single dust particle to accumulate. My father, a seasoned alcoholic, still managed to maintain a spotless dwelling after he and my mother divorced. I often wonder if living with her haphazard cleaning style drove him to drink. My own housekeeping skills fall somewhere in the center. I can handle a bit of dust and some clutter, but find myself becoming grumpy when the dust and clutter become noticeable. Housekeeping aside, it amazes me how much apparently useless “stuff” one accumulates in a short span of time. Minutes into cleaning and sorting, I decided that people other than myself might need most of that stuff that I accumulated, so I began applying price tags (exceedingly cheap price tags) to a number of items before placing each in a box to hold for our community’s annual town-wide yard sale, which takes place in July. Now, my home is free of dust, smells better and I have cleaner, neater closets and cupboards. However, I also have boxes of stuff filling up half of the space in my office. It sort of reminds me of my asparagus bed, which I planned to replant but never quite got around to. 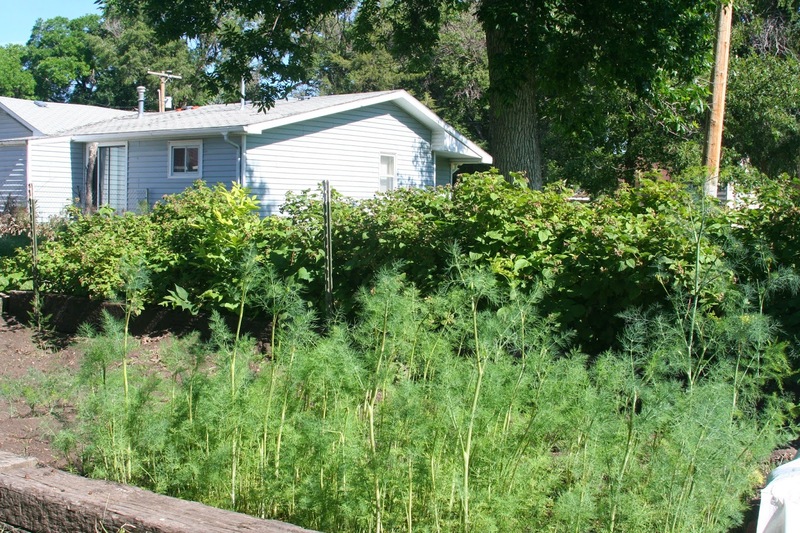 Instead, I allowed a few dill plants to go to seed last fall, which resulted in a bed filled with lush dill seedlings. Now, that is what I call good clutter. I love the smell of Dill while it is growing, but adding it fresh to food, like in the potato salad below, is even better. 1. Steam potato cubes until tender, 8-10 minutes. 3. 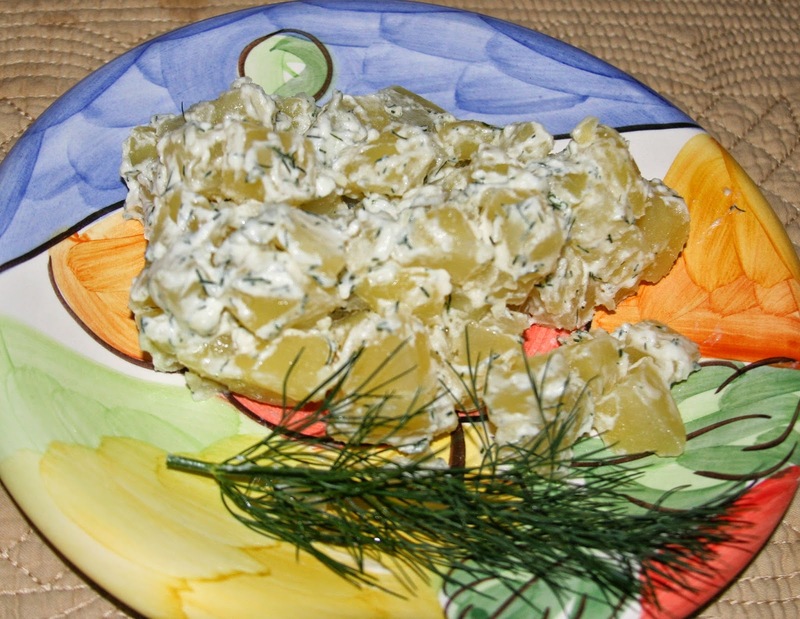 Whisk mayonnaise, yogurt, salt and dill weed together and pour over warm potatoes. 4. Toss gently to coat, cover and allow to cool at least 2 hours in the refrigerator before serving. Note: You can add a small amount of chopped celery and/or onion if you desire, but I like the simple taste of the dill with the potato. You may use low or no-fat mayonnaise and/or yogurt if you wish. Loved this recipe idea -- thought it was elegant in the sense of simple, standard ingredients, but excellent accompaniment to lots of summery foods, like BLTs or BATS (avocado). But this recipe is also good even when you do what I did today at lunch (with BATS). I had half a large baked potato that had been sitting in my fridge for several days. I skinned off the tough parts, chopped it in medium dice, added mayo and salt and dried dill (my dill didn't make it back). I might have added a squeeze of fresh lemon to perk up the potato, but didn't and it still was tasty, tasty. Thanks!